Put your ice cube in your cup of water. Drape your piece of string across the ice cube; make sure there are a few inches of slack on each side. 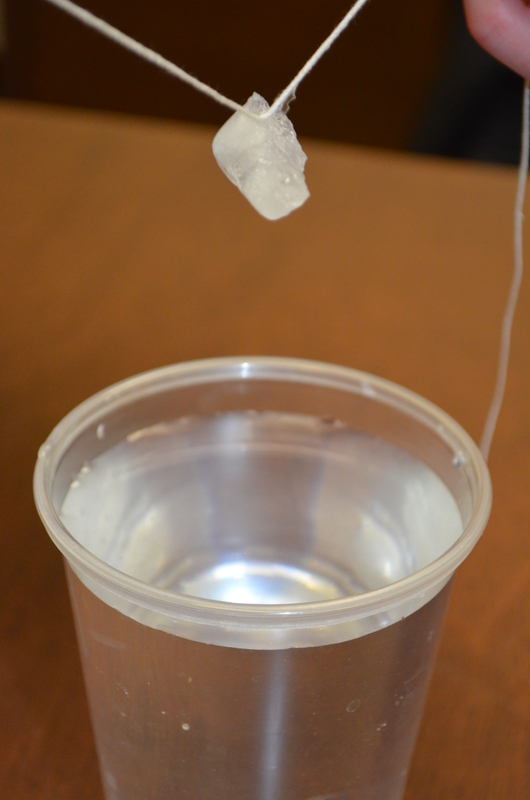 Pour salt on top of the ice cube and string. 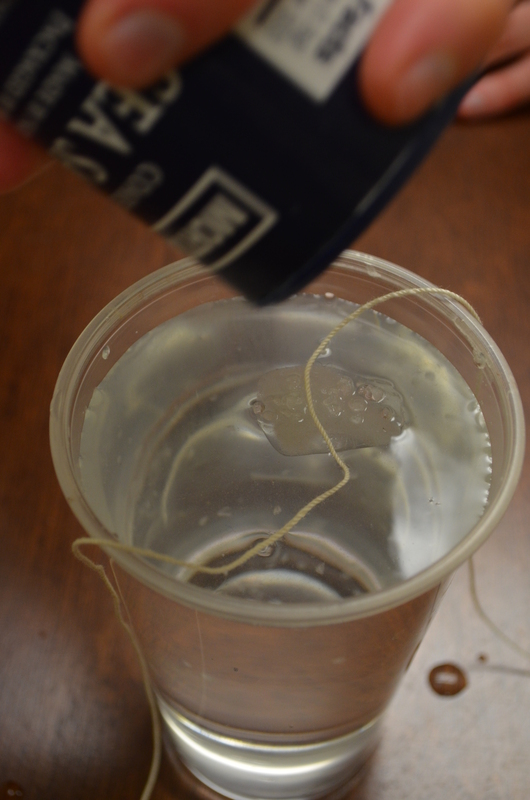 Wait for 60 seconds, then, taking the ends of the string in each hand, slowly lift the ice cube out of the water. You’ve picked up an ice cube using just a piece of string! How? 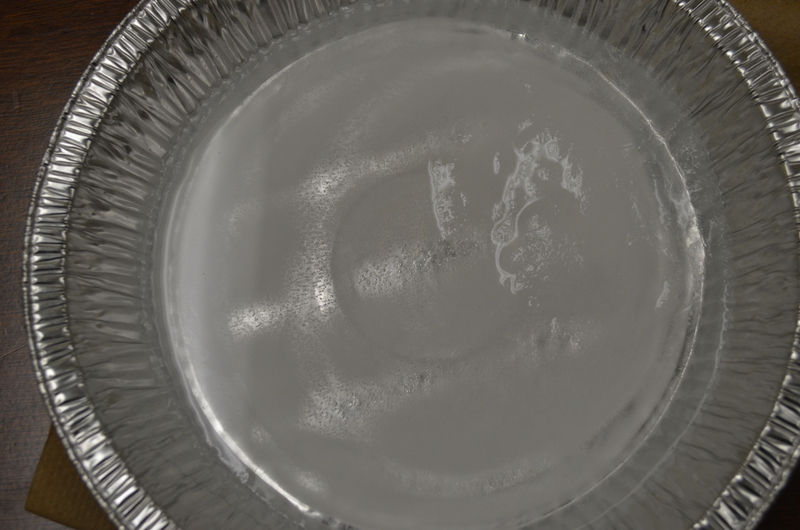 According to explorable.com, the addition of the salt disrupts the state of equilibrium that existed between the ice cube and the water. The salt molecules begin to dissolve and mix with the water molecules; this changes the water’s rate of freezing. The rate of melting is now far quicker than the rate of freezing, causing the ice to melt rapidly. In order to restore the state of equilibrium, the water’s freezing point drops, causing the ice to freeze. The salt begins crystallizing and the ice ultimately refreezes around the string. Fill each pan with water to about 2/3’s capacity. 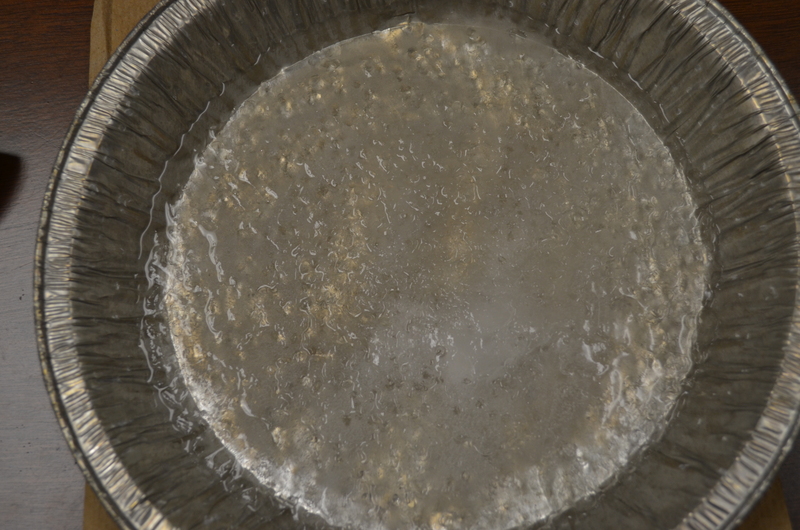 Place the pans on your freezer shelf, then wait for the water to freeze. 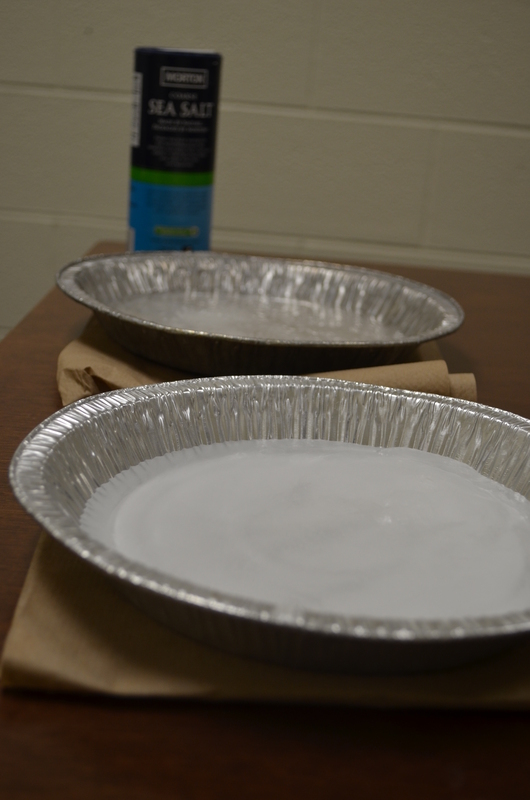 After the water has turned to ice, set your pans side by side, and choose one to sprinkle with sea salt. The salted ice will begin melting immediately. This is very similar to the way that our cities brine roads in anticipation of a snow or ice event. The science behind this method? Salt lowers the freezing (and also melting) point of water; therefore, the outside temperature must decrease significantly in order to maintain the salted ice. Waiting for the Snow to Start? 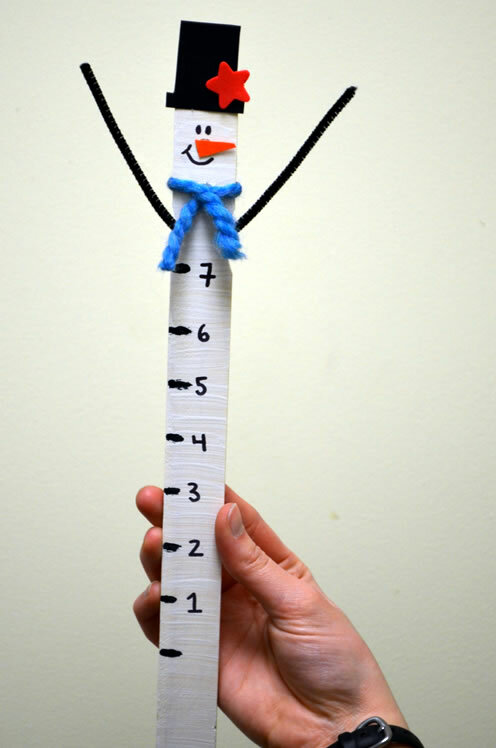 Make a Snow Measuring Stick! Paint your stir stick, if desired (we used white paint for our snowman). Create a base line a couple of inches above the bottom of the stir stick to mark zero inches. From there, use your ruler to mark off each inch going toward the top of the stir stick. Decorate your measuring stick as desired. 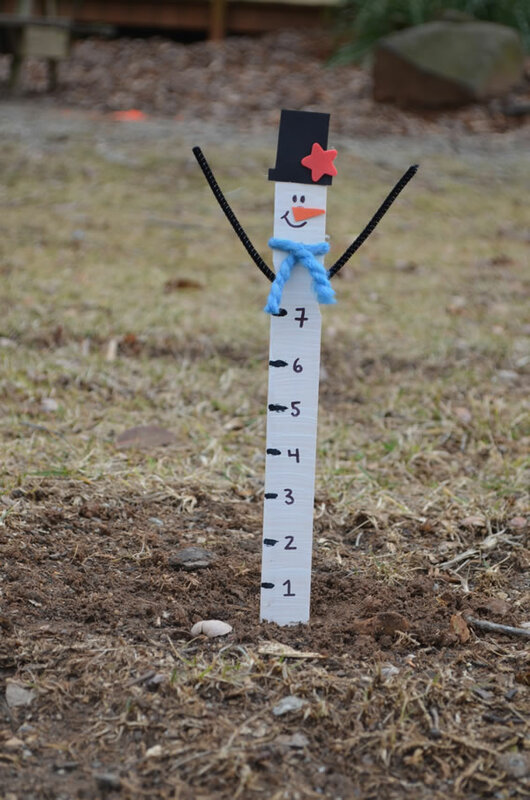 Once your measuring stick finishes drying, find a nice open spot that will receive the most snow. 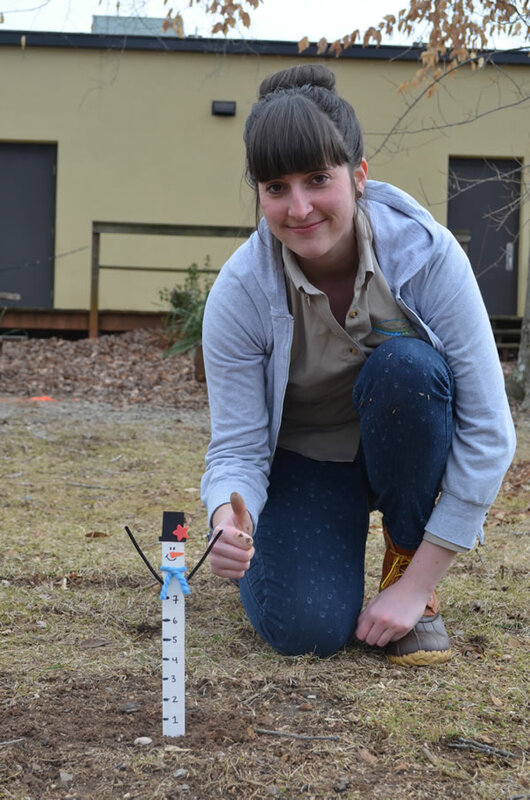 Press your measuring stick in the ground up to your base line. As the snow falls, periodically check on your measuring stick. We’d love to see how much it snows in your area, so please take pictures and share on the Greensboro Science Center’s Facebook page: https://www.facebook.com/GreensboroScienceCenter! Turn your Halloween candy into an awesome chemistry experiment! 1. Cut your coffee filter into a square. 2. In pencil, draw a line about one inch from the bottom of the filter. Using equally spaced increments, write the color of each candy on the bottom of your coffee filter. 3. 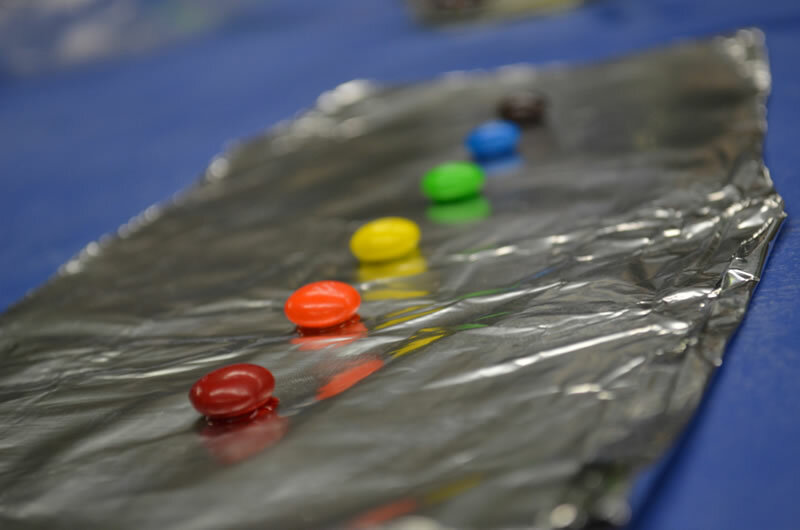 Place one drop of water on your plate or piece of foil for each colored candy you want to test. 4. Put a piece of candy on top of the water drop and allow it to sit and dissolve for about a minute. 6. Using a clean toothpick for each color, place a small dot of the colored water on your coffee filter about an inch from the bottom above the appropriate color label. 7. Let the drop dry and repeat 2 or 3 more times. 8. Place a small amount of water in your glass or jar. 9. Tape your coffee filter to the pencil and place it over your glass or jar so the bottom of the filter just touches the surface. 10. When the water reaches about an inch from the top of the coffee filter, remove the filter and let it dry. 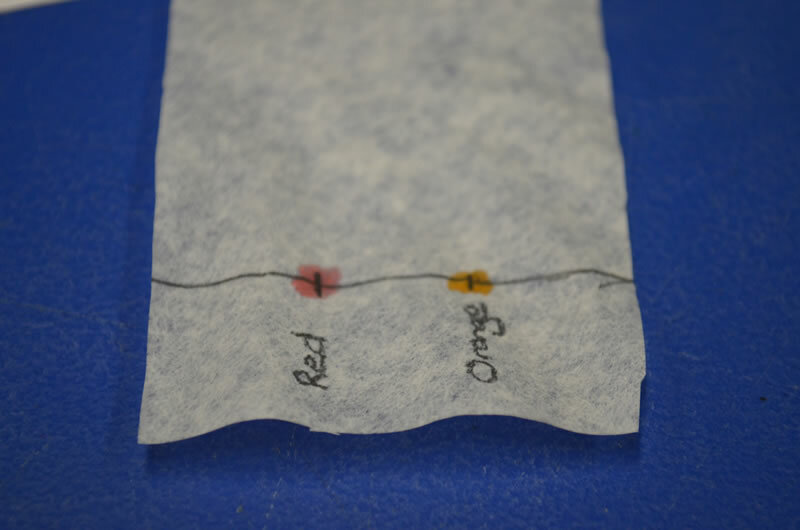 As the water soaks into the coffee filter, different components of each colored dye are separated. 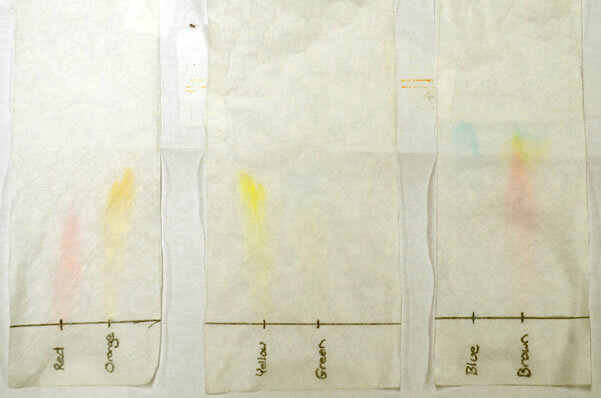 As you can probably see from your results, some colors are made up of a mixture of dyes. You’ll also notice that some colors are pulled farther up your coffee filter than others. This is all explained by the fact that various dyes have their own chemical compositions, each of which separate at varying rates. Additionally, each chemical therein absorbs different wavelengths of light and by default expresses the ones it does not absorb, meaning that those not absorbed are the colors our eyes can detect. 1. Collect some green leaves from multiple trees. 2. 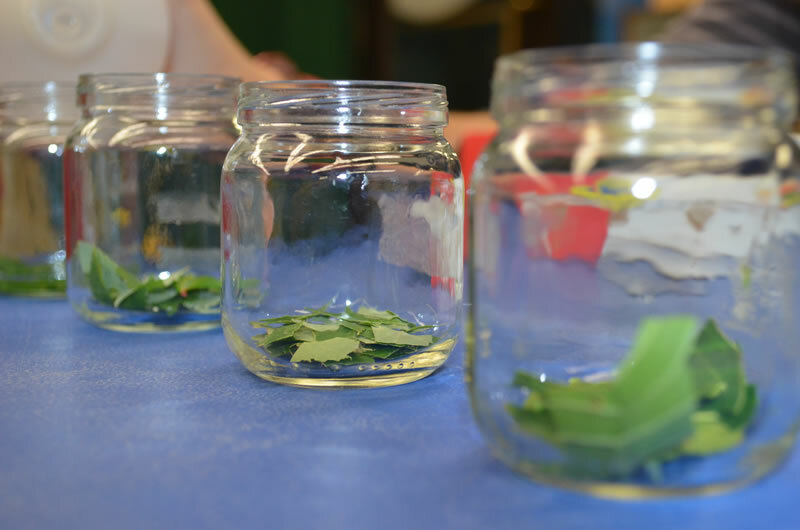 Tear up each leaf and place the pieces in a cup (one leaf per cup). 3. 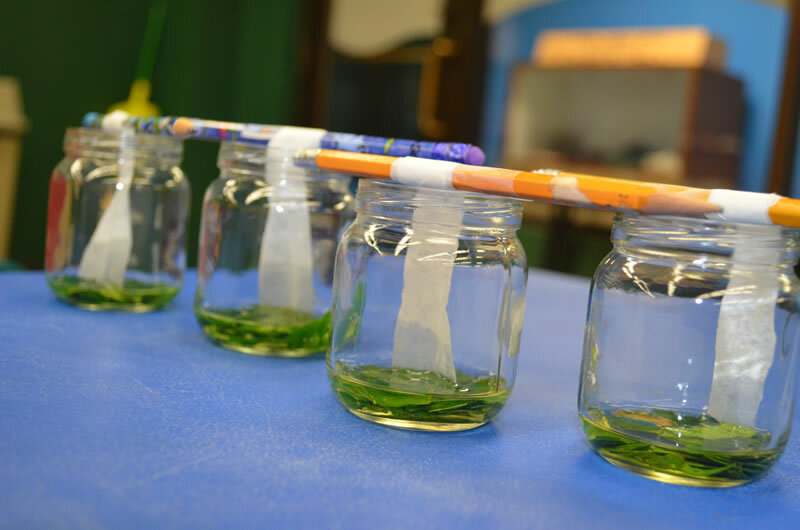 Add just enough rubbing alcohol to cover the leaf bits and cover with plastic wrap. 4. Allow the cup to sit for about 30 minutes. 5. Tie a piece of coffee filter to a pencil and place the pencil over the cup, allowing the coffee filter to dangle and just touch the top of the liquid. 6. Let the coffee filter sit for an hour or two. As the liquid traveled up the coffee filter, you probably noticed a separation of colors. More than likely, you observed varying shades of green and maybe even some red, orange and yellow areas. 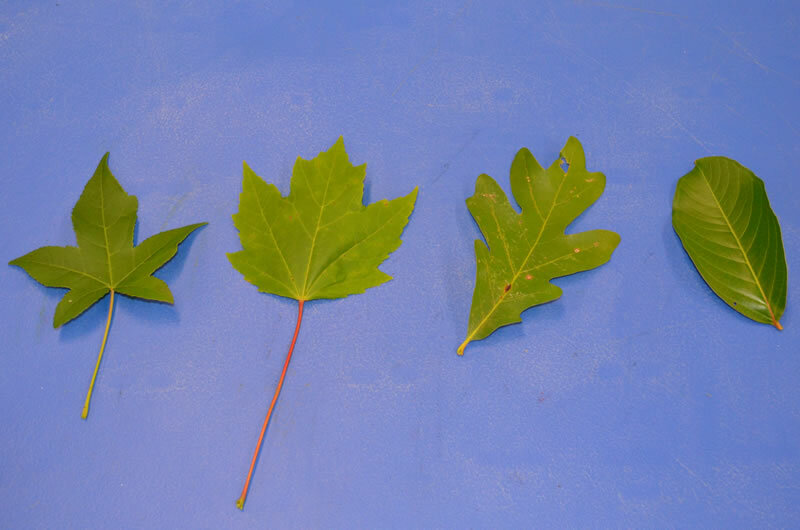 Leaves appear green because of a pigment called chlorophyll, which is necessary for photosynthesis. Chlorophyll can often cover up other pigments, though. When fall arrives and the leaves begin to change, chlorophyll breaks down, allowing you to see the red, yellow and orange pigments contained within the leaves. 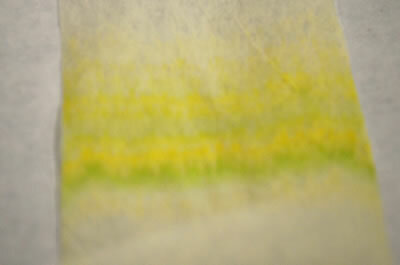 In the experiment above, you were able to see these hidden pigments on the coffee filter. Use these results to guess which trees will be most colorful in the fall!